The War to End All Wars. Except, not really. It’s 1918 and WWI is a couple of months from ending. Second Lieutenant Raleigh (Asa Butterfield) is a young officer who seems barely old enough to drink, let alone fight in a war. But as such, he asks to be assigned to the command of Captain Stanhope (Sam Claflin), his old buddy who he hopes to not just catch up with, but let his sister back home that all is well. Well, it turns out, it’s not all good with Stanhope, nor is it so good with any of the other men; most of them, when they aren’t going mad and hallucinating, are trying to lessen their pains with pills and/or tons and tons of booze. One such lad who does this is Lieutenant Osborne (Paul Bettany), Stanhope’s second-in-command who does what he can to keep a clear head, amidst all of the blood, death, mud, and violence. Together, these soldiers will wait it out and see whether or not they can take down the Germans and weaken their army to victory. But what they don’t know is that they’re literally walking right into a suicide-mission. Maybe too handsome for the awful-conditions surrounding him in WWI? I don’t know. Journey’s End is the fifth-adaptation of a millennium-old play and at times, it feels like it. There’s a lot of wear, tear, sadness, darkness, and stuffiness to it all that makes it feel like a prestige-drama that you’d find on Masterpiece Theater. And that’s not such a bad thing, but as is the case with most stage-adaptations, you can tell why it’s performed on the stage and why it sometimes isn’t always the best for the screen. For instance, there’s a lot of violence, a lot of death, and a lot of travesty that happens off-screen and we’re only given allusions to it, as opposed to nearly shown it. 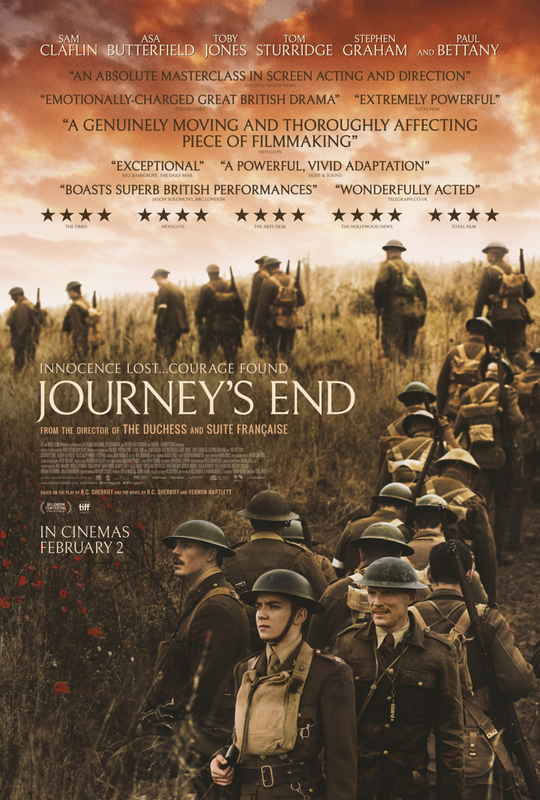 This may sound like a blood-thirsty want for a war movie, but in the case of Journey’s End, it almost feels necessary; it’s clearly an anti-war piece that takes pride in giving us actual, real-life, everyday soldiers who are plucked from their normal lives and thrown into an awful war that they don’t know how to control themselves in, or get out of. It’s the kind of story that feels like many years ahead of it’s time and it’s why it probably works perfectly well on the stage, but on film, it still feels like there’s a little something missing to give it that total push. Not him, though. That five o’clock shadow fits in perfectly. Thankfully, and as expected, too, the performances are all pretty good. Asa Butterfield handles himself quite well as the young, but somewhat brash Raleigh who does know a thing or two about warfare, but may also be a scared little boy. It’s been a long time since we’ve seen Butterfield get a meaty-role and with something to do and here, he fits in nicely with the rest of the rough and ragged boys around him, even if he is just our conduit into this story, this setting, and these characters that surround him. And this works in Journey’s End case because when you have the likes of Toby Jones, Sam Claflin, and Paul Bettany surrounding him, it’s worth getting invested in. Bettany’s quite good here as the somewhat sarcastic, but ultimately scared Osborne who makes you think everything’s going to be alright with his tone and the words he uses, but look close enough and you’ll notice that behind those eyes, lies a very terrified man. Same goes for Claflin’s Stanhope, although ultimately, he has the showier and larger performance of the bunch. And it’s interesting, too, because this is the kind of role we’re used to seeing from Bettany, but instead, Claflin settles into it nice, giving us a character we don’t know if ever to fully trust to do the right thing, nor do we even know what to expect of him. We’re given an idea early on that any shell of this man’s formerly peaceful and quiet life, has all but been destroyed and now, he settles his days with a lot of drinking, a lot of yelling, and a lot of day-dreams that could turn deadly at any second. Something which, unfortunately, we can say for most of our veterans who need the help that they’re desperately not even getting. Consensus: The transition from stage-to-film doesn’t always gel, but Journey’s End, with an honest look at the violence surrounding the war, as well as some great performances from its ensemble, still works as well as its numerous other adaptations from the past. Boys will be boys, regardless of if they’re about to get their heads blown off.